Ayahuasca is a psychedelic Amazonian brew made from the ayahuasca vine (Banisteriopsis caapi) and either chacruna (Psychotria viridis) or chaliponga (Diplopterys cabrerana). Anahuasca (from ayahuasca analogues) is similar to ayahuasca, but made from other plants. In addition, this category contains all potent sources of DMT, including the ones that are traditionally used to make yopo and epena snuffs. 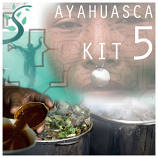 We offer 6 complete ayahuasca kits to make your own psychedelic, visionary Amazonian brew that can be made from a variety of plants. These kits originate from the Amazon basin, where it is the most important medicine. These are the most "classic" or "traditional" ayahuasca of all Ayahuasca kits. It is also the combination that the Santo Daime and UDV churches use. The nature of Ayahuasca sets it apart from almost all other hallucinogens. The content and quality of these visions point towards a completely overwhelming occult scenario for the user. Users also seem to see the experience as real, not a "hallucination" in the usual sense of the word, and a portal to other worlds which exist alongside our own. Ayahuasca is a powerful mixture of one herb containing DMT and another herb containing MAO-Inhibitors. It is used by the Santo Daime church and the Uniao do Vegetal for their rituals. It's a mixture of an MAO inhibitor like Peganum Harmala or Banisteriopsis Caapi with a DMT containing plant like Psychotria Viridis, Diplopterys Cabrerana, and Mimosa Hostilis. DMT, which is not normally active orally but becomes active in the presents of MAO inhibitors. It is a powerful visionary and spiritual brew used for a very long time by the Shamans in Peru for healing and spiritual proposes. They believe Ayahuasca heals your spirit, soul and body. All our ayahuasca packs contains the most traditionally used ingredients for Ayahuasca. Psychotria Viridis, Diplopterys Cabrerana, Syrian rue and Mimosa Hostilis. All kits include a booklet with instructions and recipe. There are no fixed ayahuasca recipes. Dosages depend on the individual plant's growing conditions and on the sensitivity of the user. Every shaman has his own recipes, which are varied depending on the desired effect. Traditionally other plants are added such as tobacco, datura or brugmansia, to give a certain direction to the trip. It is not advised to add such plants unless you are an experienced ayahuasca user. All our 6 Ayahuasca packs contain enough ingredients for 1 person / trip.